JQuery autocomplete helps user in picking up matching keyword while entering characters into the auto complete text box. User must type minimum number of chars before the filter ( search ) as applied, for a large number of items it is better to keep a higher value. For local data or less data we can keep it minimum or zero. The menu ( option list ) takes postion with respect to autcomplet element based on the different values. We will create one object to get values. $('#d2').html( "position my : "  + option_obj.position.my + "
close Closes the open menu of autocomplete. destroy Removes functionality of autocomplete. 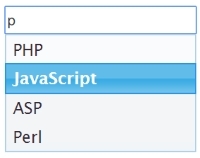 instance Retrives Instance object of autocomplete. option WE can get option value by specifying option name. Using this object we can display option values ( name : value ) in this demo. search Triggers search event on autocomplete element. We can pass the search string and get the filtered options in menu. We will use radio buttons to pass pre-set search string to autocomplete element. widget We can get juqery object containing menu element. change Triggers when autocomplete input is blured ( when focus moves out ). close Triggers when menu of autocomplete is hidden. create Triggers when autocomplete is created. focus Triggers when focus moves to an item ( not selecting ). open Triggers when option menu is opened or updated. response Triggers when search completes but menu is not opened. search Triggers search is applied and options are not given. select Triggers when one option is selected from menu.